Seattle-based RainBank Rainwater Systems is the northwest dealer for Pinnacle Water Tanks and is a Contain Water Systems, Inc. Certified Tank Installer. 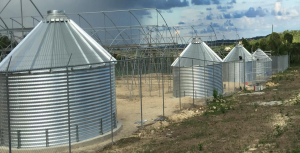 Contain Water Systems steel water storage tanks are ideal for any water storage application where the intent is to store water for residential or commercial applications that include rainwater harvesting and fire suppression. Contain Water Systems tanks are backed by a 20-year warranty, which is significantly longer than anything else found on the market. Tanks are engineered to meet seismic code compliance. Tanks come with a standard engineering package and all models have the option to be wet sealed and stamped upon request. 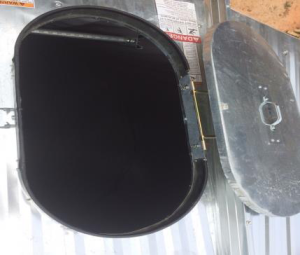 Tanks come with a geotextile pre-liner and flexible membrane liner for potable and non-potable applications with tank liners secured to the walls with engineered brackets. Tank sizes range from 6 feet to 48 feet in diameter, with capacity up to 428,602 gallons. Tanks are field erected by certified installers. ♦ Wooden cladding for that old style look, providing cosmetic appeal that enhances and blends with the landscape. ♦ 30-degree high rib roof, flat seam roof, or dome roofs are available. ♦ Optional vertical wall panel access doors at ground level offer full access through the liner for added safety during installation and maintenance. 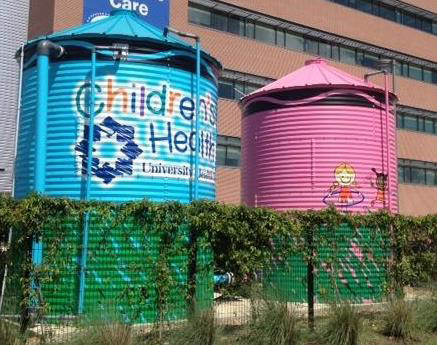 Roof access doors are standard for all Contain Water Systems’ tanks. ♦ Double row bolting on vertical seams increases shear strength compared to single row vertical bolting of other tank manufacturers. ♦ Access ladders, ladder cages, penetration flanges, diffusers, tank level indicators and other options are available. Contain Water Systems Customers include: Apple, Sea World, Chevron, Dell, Walt Disney World Florida, Bridgestone/Firestone, Home Depot, and numerous public and private sector projects. Pinnacle, Contain Water Systems, Inc. and RainBank’s shared philosophy is simple…to provide quality service, quality products and have an unprecedented approach to attain the highest level of customer satisfaction in the industry. 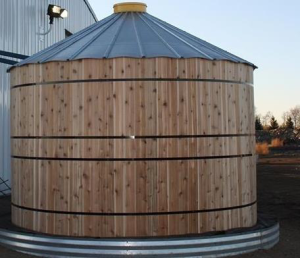 Use the form below to contact us for steel water tank pricing. We look forward to working with you.